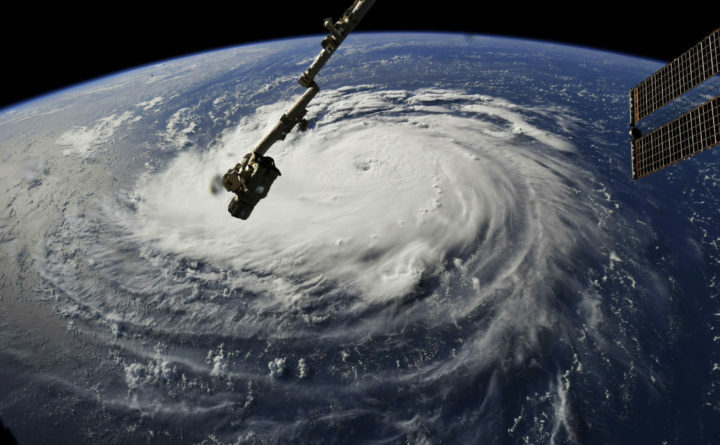 This photo provided by NASA shows Hurricane Florence from the International Space Station on Monday, as it threatens the U.S. East Coast. Forecasters said Florence could become an extremely dangerous major hurricane sometime Monday and remain that way for days. RALEIGH, North Carolina — Florence rapidly strengthened into a potentially catastrophic Category 4 hurricane on Monday as it closed in on North and South Carolina, carrying winds and water that could wreak havoc over a wide stretch of the eastern United States later this week. A warm ocean is the fuel that powers hurricanes, and Florence will be moving over waters where temperatures are peaking near 85 degrees, Blake wrote. And with little wind shear to pull the storm apart, Florence’s hurricane wind field was expected to expand over the coming days, increasing its storm surge and inland wind threats, and raising the likelihood of life-threatening freshwater flooding. By noon Monday, Florence had top sustained winds of 130 mph. It was centered about 1,230 miles east-southeast of Cape Fear, North Carolina, and moving west at 13 mph. Its center will move between Bermuda and the Bahamas Tuesday and Wednesday, and approach the coast of South Carolina or North Carolina on Thursday, the National Hurricane Center said. On North Carolina’s Outer Banks, Dawn Farrow Taylor, 50, was gathering photos and important documents and filling prescriptions Monday before heading inland. She grew up on the shore, and said this will be only the second time she’s evacuated. In Jacksonville, North Carolina, about 20 miles inland, some residents picked up hurricane supplies during their normal weekend shopping, The Daily News reported. Ilija Cesal told the newspaper he wouldn’t worry about buying extra water or other supplies for a few more days. Lining up behind Florence, Isaac was about 1,150 miles east of the Windward Islands with top winds of 75 mph early Monday, moving west at 14 mph. Isaac’s forward movement was accelerating on a path to cross into the lower Caribbean on Thursday. Helene, meanwhile, was still in the Atlantic’s spawning ground for hurricanes off the coast of Africa, swirling with 105 mph winds and forecast to become a major hurricane, about 375 miles west of the Cape Verde islands. Associated Press writers Jennifer N. Kay, Jeffrey Collins, Meg Kinnard and Jeffrey Martin contributed to this report.